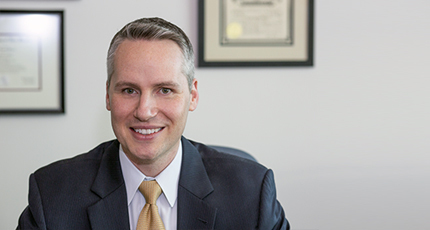 Kevin Pierce focuses his practice in the areas of healthcare, employment, commercial litigation, products liability, professional liability, and personal injury. He represents clients ranging from individuals and local businesses to international corporations. Kevin’s litigation experience includes successfully defending clients in jury and non-jury trials, representing clients at mediation, arguing discovery and dispositive motions, and briefing appeals. Kevin’s experience also includes previously serving as the General Counsel and Chief Administrative Officer for one of New Mexico’s largest child- and family-focused behavioral health providers. In that capacity, he oversaw and advised the company on healthcare compliance issues, complex employment issues, contracting, and general governance. While attending law school, Kevin was an editor on the New Mexico Law Review and participated on the Health Law Moot Court team. He also served as an extern in the Second Judicial District Attorney’s Office in Albuquerque where he had the opportunity to try two felony cases, assist in the preparation of numerous other cases for trial, argue motions, and participate in sentencing hearings. Kevin practiced as a student attorney in the University of New Mexico’s Business and Tax Law Clinic where he represented low-income tax payers in disputes with the IRS and the State of New Mexico and assisted low-income entrepreneurs and nonprofit corporations with a variety of business law issues. Immediately following law school, Kevin served as a judicial clerk to the Honorable James A. Parker in the United States District Court for the District of New Mexico. A graduate of Albuquerque Academy, Kevin currently serves as the President-elect of the Alumni Council, and from 2003-2017, he coached football at the school in various capacities.